As part of our wider range of height safety equipment, this 3 point scaffolders harness kit is made up of a comfort harness, lanyard with impact-absorbing webbing and either a rucksack or kit bag for extra storage. You can choose the harness for this kit from several size categories, starting off at small and going up to XXL on the largest examples. Whichever you pick, the key features will remain the same. All the straps are adjustable, the buckles are easy to connect, there are 2 D-rings at the front and one at the rear. The webbing lanyard has a built-in shock absorber can will cut the impact of a sudden fall to under 6kN, which should limit the likelihood of injuries occurring during an accident. The loops at either end come with their own protective webbing, so the entire assembly is built to stand the test of time. The 3 point scaffolders harness kit is just one of the options available to our customers. You can also find simple single point scaffolding kits and 2 point scaffold kits on our site, so you can adjust your order depending on your budget and requirements. 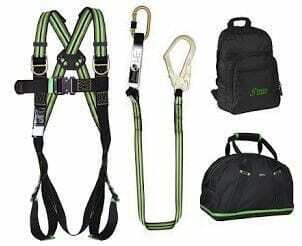 The Rope Services Direct team is here to help you with any questions you might have about the height safety kits we sell. You can call our specialists on 01384 78004 or enter your contact details on our site to find out more. 3 Point Scaffolders Harness Kit Overall rating: 5 out of 5 based on 6 reviews.